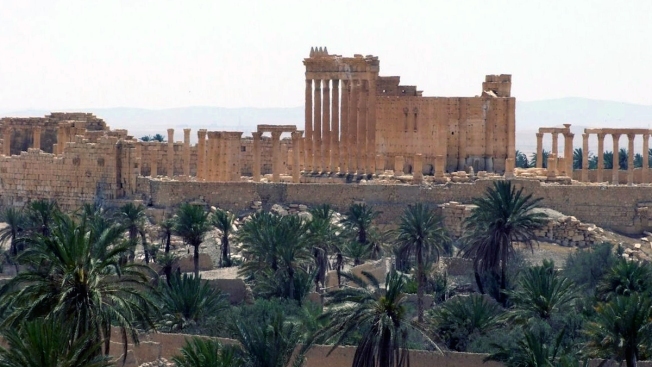 This file photo released on Sunday, May 17, 2015, by the Syrian official news agency SANA, shows the general view of the ancient Roman city of Palmyra, northeast of Damascus, Syria. Syrian government forces recaptured a Mamluk-era citadel in Palmyra from the extremist Islamic State group on Friday, Syrian state media and monitoring groups said, as the fierce battle for control of the historic town entered its third day. The city known to Syrians as the "Bride of the Desert" is famous for its 2,000-year-old ruins that once drew tens of thousands of visitors each year before ISIS destroyed many of the monuments. The extent of the destruction remained unclear. Initial footage on Syrian TV showed widespread rubble and shattered statues. But Palmyra's grand colonnades appeared to be in relatively good condition. The fall of Palmyra comes a month after a partial cease-fire in Syria's civil war came into force. The truce was sponsored by the United States and Russia in part to allow the government and international community to focus on Al-Qaeda styled militants, among them the ISIS group. ISIS drove government forces from Palmyra in a matter of days last May and later demolished some of its best-known monuments, including two large temples dating back more than 1,800 years and a Roman triumphal archway. Still, state media reported that a lion statue dating back to the second century, previously thought to have been destroyed by ISIS militants, was found in a damaged but recoverable condition. ISIS also demolished Palmyra's infamous Tadmur prison, where thousands of government opponents were reportedly tortured. Maamoun Abdulkarim, director of the museums and antiquities department in Damascus, said Palmyra's Great Colonnade had suffered only minor damage. "We will rebuild what you have destroyed," he said, addressing ISIS. The Syrian opposition, which blames the government for the country's devastating civil war and the rise of ISIS, rejected that narrative. Residents told The Associated Press that ISIS evacuated all of Palmyra's civilians to other territories under its control before government forces entered the city. Government forces had been trying to retake the town for nearly three weeks. Gen. Ali Mayhoub announced on the Syrian TV Sunday afternoon that its recapture "directs a fatal blow to Daesh, undermines the morale of its mercenaries and ushers in the start of its defeat and retreat," referring to ISIS by its Arabic acronym.